This past summer, Carroll Hill School welcomed new principal Roy Stiles to help lead the building to greater success. Now, nearing the end of his first year, Stiles is transforming the school culture and adding needed supports. Each morning, students recite a pledge to their learning in addition to the U.S. Pledge of Allegiance. 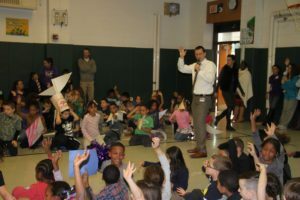 Stiles and Assistant Principal Joe Foglia have laid out clear expectations about what it means to be a Carroll Hill School student. They know the reason that they come to school is to learn. With this mentality, suspensions are down 39 percent under Stiles’ leadership. Roughly 140 students are now enrolled at the new CHS after-school program open to all students, Grades K-5. Students attend the program two days a week where they participate in project-based learning in ELA and math. Stiles said this extra learning time is already making a difference. In addition to the after-school program, Stiles has implemented a peer tutoring program where 5th Grade students work with 1st Grade students twice a week during breakfast. The mentor takes pride in helping younger students learn and serve as role models. The mentees get the benefit of added learning time. Stiles has also introduced a greater focus on the adults in the Carroll Hill School Community including both staff and parents. Teachers meet once a week in grade-level teams to discuss student data and their needs in the classroom. Stiles continues the monthly “Coffee with the Principal” event where parents are invited to engage in an open dialogue with a different focus each month. In addition, the parent volunteer group has increased significantly this year. Stiles is hopeful for the future and says the improvements will be seen through immediate measures, but also in the future.